Beginning Watercolor teaches aspiring artists everything they need to know to get started painting in watercolour. This helpful resource begins with a basic introduction to the essential tools and materials artists need to get started, including choosing the right paintbrushes, watercolour paints, sketchbooks, and canvas. Additionally, artists will learn the fundamentals of watercolour, as well as a variety of painting techniques, including creating washes, mixing colours, creating soft blends, rendering realistic textures, and working wet-into-wet. 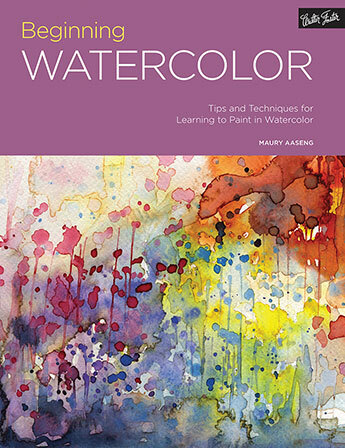 Beginning Watercolor guides beginners through a series of easy-to-follow, step-by-step projects covering a variety of watercolour methods and techniques, including helpful tips and advice when painting landscapes, still lifes, portraits, and more. With helpful tips and detailed, beautiful artwork to guide and inspire, Beginning Watercolor is the perfect resource for watercolour artists just getting started in this colourful medium.